The remarkable Galapagos Penguin (Spheniscus mendiculus) is the only penguin species to be found naturally north of the equator. A favorite among visitors to the islands, they are often seen sunning themselves on rocks or swimming, deftly catching fish with surprising quickness. The total population of Galapagos penguins is very small, numbering only a few thousand in total. Penguins are more common in colder areas of the southern hemisphere, more often associated with icebergs and frigid temperatures than the cacti and scorching heat of Galapagos. They are native to much of Chile and Argentina in addition to Antarctica, Africa and Australia and New Zealand. Penguins are birds, with beaks, wings, and feathers just like any other. Their wings serve as fins, however, and their small, fine feathers serve as a sort of insulating fur. The closest living relative of the Galapagos penguin is the Magellanic Penguin, native to southern Chile. The South African Penguin, Humboldt Penguin (Argentina) and Fairy Penguin (New Zealand and Australia) are more distant relatives, as they are also smallish and have similar markings. All are members of the genus Spheniscus, which is a group of smaller-sized penguins. It is thought that ages ago, some penguins were carried north and west from southern Chile by a storm or ocean currents and marooned in Galapagos. Somehow, the cold-weather birds survived and multiplied. Over the years they adapted, losing some of their fat (which they no longer needed) and becoming smaller. They swim quickly, often reaching speeds up to 15 miles per hour underwater. They also developed a way to cool off, releasing heat through their webbed feet. For this reason, you can often see them shading their feet with their bellies. They also release heat through hairless spots on their cheeks. The Galapagos Penguin breeds all throughout the year, laying two to three eggs. They nest in burrows near the rocky shores. Both parents incubate the eggs and feed the young, bringing them small fish such as anchovies and sardines which are regurgitated in the nest. During times of scarcity, such as el Niño years, they may stop breeding for a period of time. This decreases competition for available resources and makes it more likely that the colony will survive. 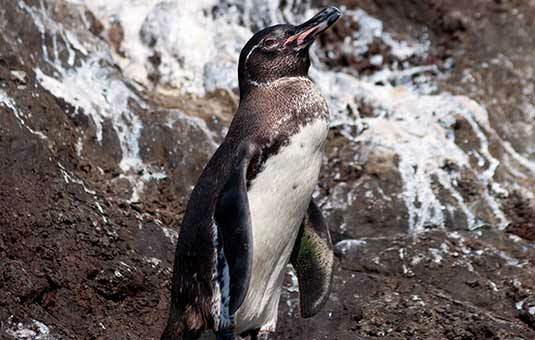 The penguins do not have any natural predators in Galapagos, although sharks and sea lions can be a threat. Their biggest problem is introduced species such as rats, dogs and cats, which raid the nests and eat eggs and young penguins. Most of the penguins in Galapagos are found on the western islands of Isabela and Fernandina, where they can be seen sunning themselves on rocky shores and swimming. They can be found on other islands as well, including Santiago, Bartholomew and Floreana. Bartholomew is a good place to see them, because they are often seen near the disembarkation point for the short hike to the top of the hill, and a small colony at the excellent snorkeling spot at the base of Pinnacle Rock.